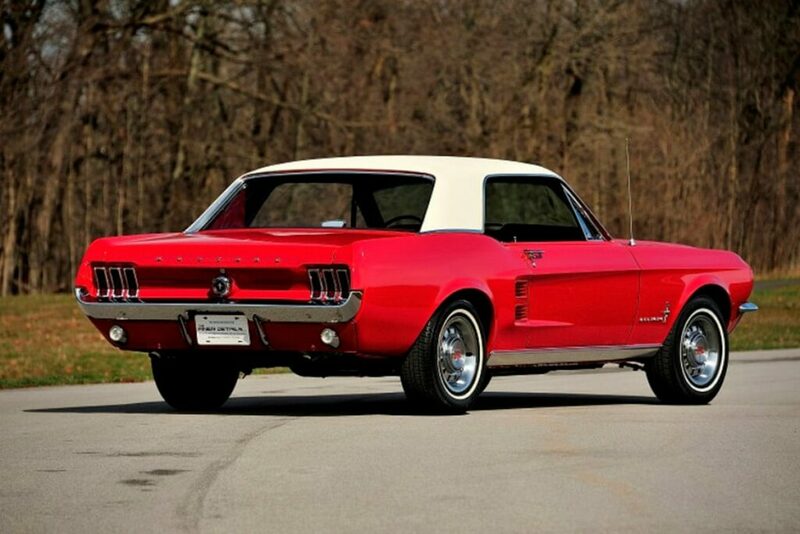 Harry Donovan set out in 2009 to restore his late wife Marie’s 1967 Mustang coupe. 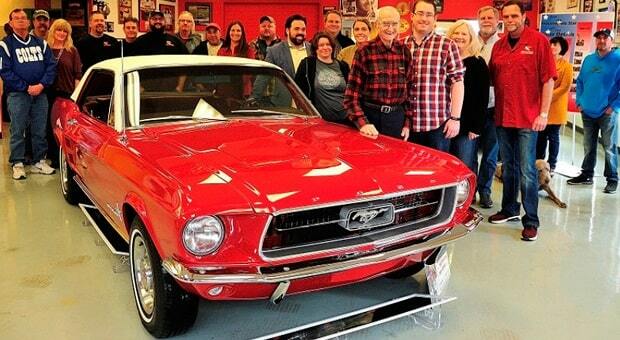 Someone who claimed to be a family friend heard about Mr. Donovan’s desire to restore the car and offered his restoration services. Thinking he’d found someone who would think of the project as more than a simple business transaction, Donovan handed over several thousand dollars and the keys. He didn’t see the car again for several years, when it was recovered as a rolling shell. After the State of Indiana helped Mr. Donovan recover what was left of his car, Tim Evans, a reporter from the Indy Star, heard about Mr. Donovan’s situation and ran the story of the theft and recovery of the car in his July 7, 2016 “Call for Action” feature in the paper. Jay Webb and David Engle both read the story and were inspired to help. 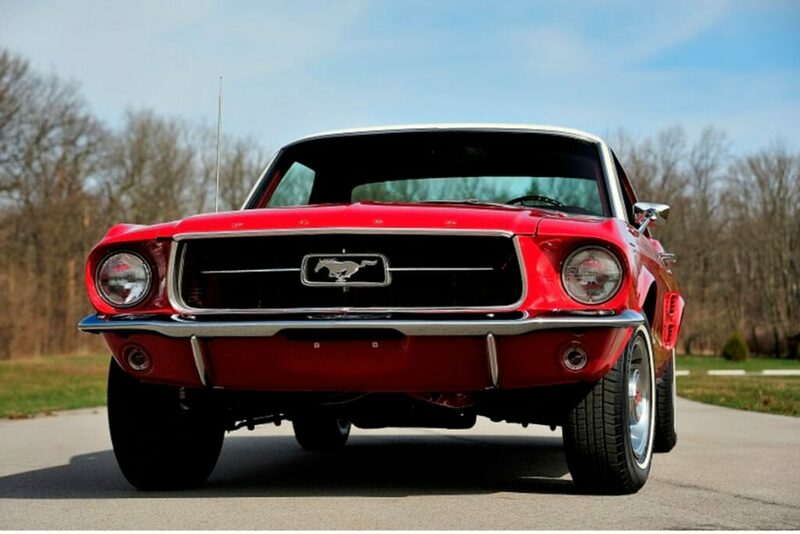 Webb and Engle, who work at a local restoration shop called The Finer Details, discussed the story when they got to work that day and decided they would give their automotive restoration expertise to Mr. Donovan without charge. They felt so strongly about it that they almost saw it as their civic duty. They reached out to the local automotive community for needed parts and materials and got to work. 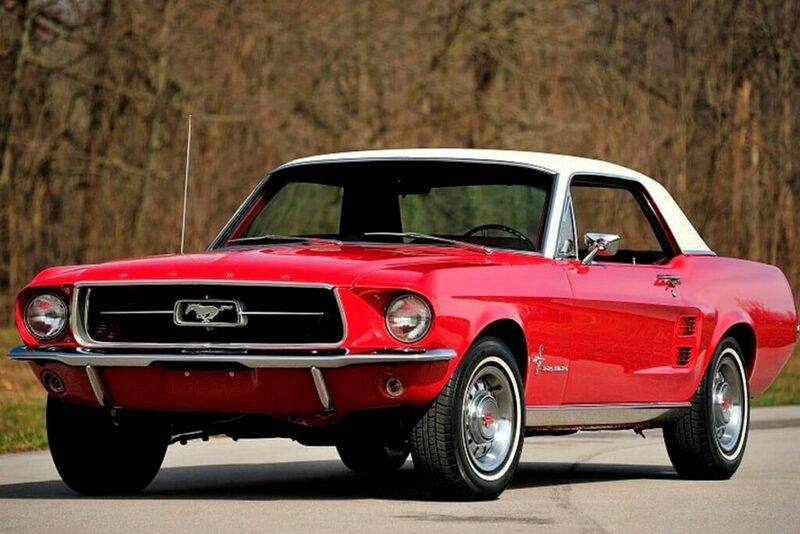 The full restoration took almost two years to complete. Support for Harry Donovan’s project of love originally came from Webb and Engle, followed by everyone at The Finer Details, but an avalanche of support came soon afterward as word of the project and the story behind it got out. Tony Katz of local radio station WIBC helped spread the word. Various American Legion Posts also lent their support to a fellow veteran. 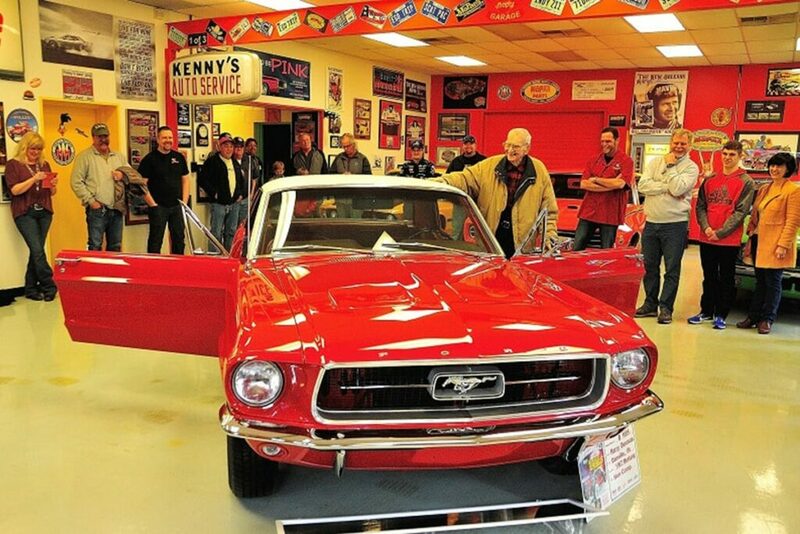 The end result of this outpouring of love and respect is a beautifully-restored Candy Apple Red 1967 Mustang coupe that World War II Veteran Harry Donovan can drive with pride and love. 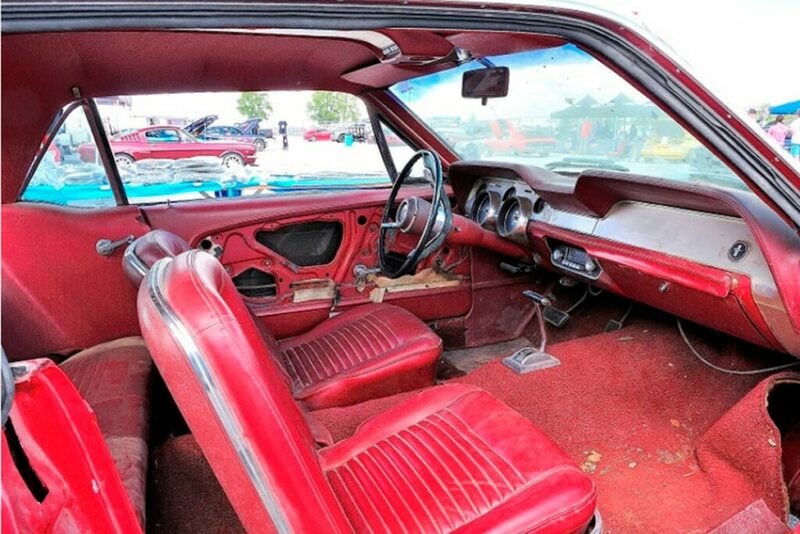 Jay reached into the open door and turned on the car’s restored radio, and out came Donovan’s favorite song: the Patsy Kline hit “Marie.” Mr. Donovan mentioned in September 2016 that he and Marie had talked after their kids were grown about how they wished they’d bought the V8 option instead of the inline six. 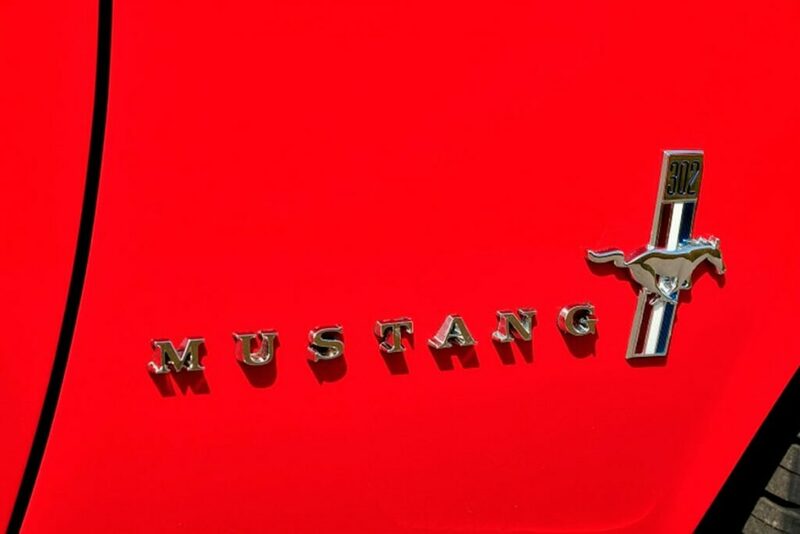 In answer to this desire, a freshly restored 302 V8 was revealed when the hood was popped a few minutes later. Donovan eagerly said “I want to hear the V8 engine run!” and so he was helped into the driver seat, motioning his grandson Harry “Hobs” Donovan IV into the passenger seat. It started right up when he turned the key and a look of pleasure came over his face as he revved it up and listened to it for bit. 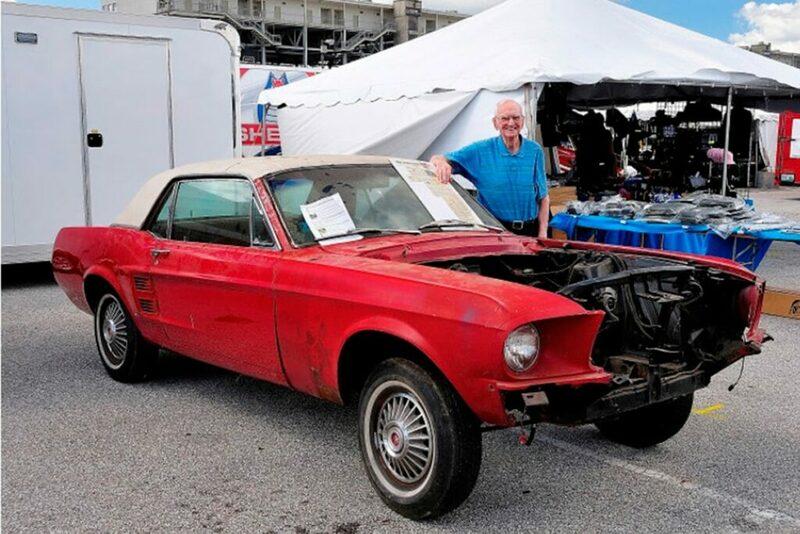 Hobs said the last time he recalled riding in the Mustang was 13 years earlier, when his grandmother Marie took him and her other grandchildren out to ice cream at the local Dairy Queen.